The Insect Warrior from Guilds of Ravnica has done most of its damage recently coming out of the sideboard. This past weekend at Grand Prix Memphis, it was featured in the sideboards of both Top 8 Sultai decks, as well as the aggressive Gruul deck. Standard deck designers have been including it… Just not as the centerpiece. Patrick had the pretty novel idea of playing Kraul Harpooner in his main deck at the Mythic Championships. There are many benefits, including just mugging the dominant Mono-Blue deck on turn two. Can you imagine an opponent passing with a Siren Stormtamer in play on turn one? Maybe a Healer’s Hawk? Because the 3/2 Harpooner can take one of those creatures out while both generating card advantage and establishing a threat on the board, the positional advantage generated on turn two can be absolutely devastating. Talk about getting a free win! But the advantage of adding this guy to the main it isn’t just the ability to catch Mono-Blue or White Weenie unaware. Relative to the stock Sultai list, Harpooners are taking up creature removal slots (while remaining creature removal-ish). So you also get a turn two threat that you can use to attack against Esper or Wilderness Reclamation! 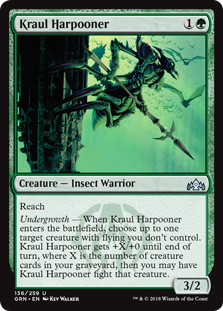 The fact that Kraul Harpooner is a guy you can cast early instead of a Cast Down that you will never cast might make all the difference in a race. We spend this podcast talking about all the relevant decks of Standard, including the resurgent “one true color” according to Mike. In the green-splashing Red Deck, there is a novel synergy between Goblin Chainwhirler and the Harpooner. Both are Warriors. Therefore you can open up on Mountain; play Unclaimed Territory on turn two (naming Warrior) to hit the Harpooner; then play a second Mountain for Goblin Chainwhirler on three without missing a beat! The Gruul midrange deck is chock full of other Goblins, so this might be a slightly unusual use of Unclaimed Territory, but it’s important to note… Especially as Growth-Chamber Guardian is not just a Crab, not just an Elf… But a Warrior as well! Play more Thief of Sanity? Try playing four Thief of Sanity already! Thief of Sanity in Jeskai? Since Thief of Sanity is a Dimir (ergo black-blue) and Jeskai is a white-blue-red color combination… So you can’t actually play the Thief in Jeskai. Mike briefly argues that it’s not necessarily the case that Esper is the superior control deck to Jeskai in Standard (regardless of what the Top 8s say). Patrick argues that the ability to play Thief of Sanity after sideboarding pushes black over the red three-color control version. This three drop Specter is of course an awesome tool in Esper decks after sideboarding, offering a combination of persistent card advantage and ongoing disruption against any of the Wilderness Reclamation type powerhouse decks. 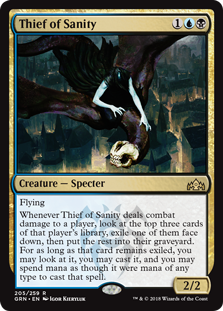 How About Thief of Sanity in Sultai? This card can be played in the main deck or the sideboard. While we are not sure which is best… We do know that we would lean on playing more copies. Argument For Main Deck: Llanowar Elves on turn one can potentially allow you to play your Specter on turn two! Argument Against Main Deck: It’s awful against decks like Mono-Red and you might just lose if you draw two copies. 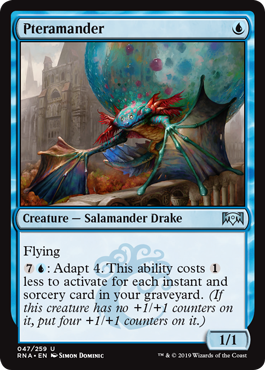 That said, this creature is much like the full promise of the Mono-Blue Aggro deck — currently the most successful deck in Standard — all bundled into one card. This is essentially one of Mono-Blue’s 1/1 evasion creatures that starts with Curious Obsession already in play. It can keep you when you’re already winning. It can steal from decks that require particular spells to function. And especially coming out of the sideboard, it can help control decks put their victims on a clock. Alexander Hayne, the great Canadian Pro Tour Champion, put out a new Mono-Blue deck featuring Pteramander this week. Packing only 19 Islands, Hayne’s deck relies on a ton of super cheap threats, including 11 one casting cost evasion creatures. Alongside Pteramander, Mist-Cloaked Herald and Siren Stormtamber make for many creatures to catalyze Chart a Course or Curious Obsession on turn two. After an off week, Mono-Red players suddenly remembered they are allowed to run Experimental Frenzy! Part of the Red Deck’s bounce back came from the power of Light Up the Stage. This Ravnica Allegiance sorcery found homes immediately, but often at the cost of the more expensive Frenzy. Why? Light Up the Stage kind of does the same thing as Experimental Frenzy (draws cards). Turns out it doesn’t have to be either / or. 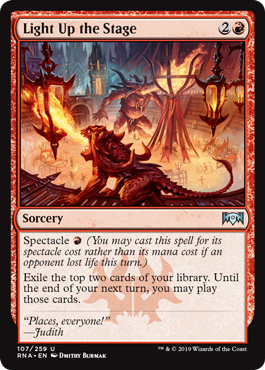 Casting Light Up the Stage with Experimental Frenzy in play gives you the option of casting an instant on top of your library before Light Up the Stage resolves. This creates a bit of a tension in Mono-Red Land. Do you maximize your instants? That would mean playing Wizard’s Lightning… Possibly over Skewer the Critics. But is Skewer — Light Up the Stage’s Spectacle buddy — just too good not to play? How about Fanatical Firebrand? Many mages have cited the little Pirate as the weakest card in Mono-Red. Maybe… But it’s also the best setup man for Spectacles in the deck. There is no easy cut for the format’s Red Deck. Yeah? Not only can you follow up by casting their Hydroid Krasis for a bunch if your Hostage Taker lives, even if it doesn’t, the opponent will get back a 0/0 Krasis. Tons more Standard in this week’s podcast! How Do I Make a Hydroid Krasis Deck? The top deck from the first week of Ravnica Allegiance Standard was Sultai Midrange. The inheritor of the Golgari decks, Sultai Midrange uses Merfolk Branchwalker and Jadelight Ranger to turn creatures into extra cards. At the top end, instead of just playing another big Jadelight Ranger, Sultai (over Golgari) tops up on Hydroid Krasis: It’s bigger, it draws tons and tons of cards (instead of just one), and it gives you something to do with all that Explore land! Hydroid Krasis is a powerful finisher in a Wilderness Reclamation deck. A blue mage can tap out for it main phase without fear: Draw some cards! Gain some life! Wildnerness Reclamation will untap your lands and you can play defensively on the opponents turn. The hip new Gates builds are also playing the Jellyfish Hydra Beast. Because accelerators like Circuitous Route can give you the materiel to make X big… It’s just a big threat in Gates. The Krasis can compliment your Angels, or draw you into your relatively limited sweepers. Or kill a mage. While it is effectively not-so-different from the 187 creatures of the Golgari deck, the Krasis differs meaningfully against blue opponents. Jadelight Ranger only Explores when the Jadelight Ranger actually resolves. 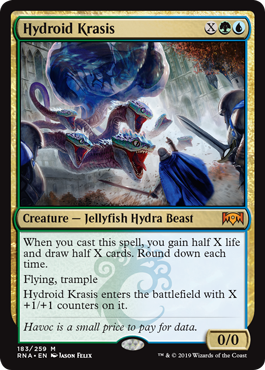 Hydroid Krasis, on balance, draws cards and gains life when you cast the creature, not only if you resolve it. This rarely matters if the opponent isn’t playing permission. But you’ll appreciate this nuance in the cases that he is! One of the long-game uses of Memorial to Folly is to re-buy this creature. In the older Golgari decks, you might draw the spell-like Memorial thanks to Jadelight Ranger… But late in the game you were probably also just re-buying the Jadelight Ranger. The Krasis gives you the option to recover and play a much more powerful finisher. Long game flooded? Tap a ton of mana! Gain a ton of life! Use your creature slot to hit an extra land! This week’s podcast also features the early struggles of Mono-Red, a cool new Bant Flash build, color conflicts in Grixis, and much more. Check it out!